This is one of the recipes that have been in my backlog for a while. 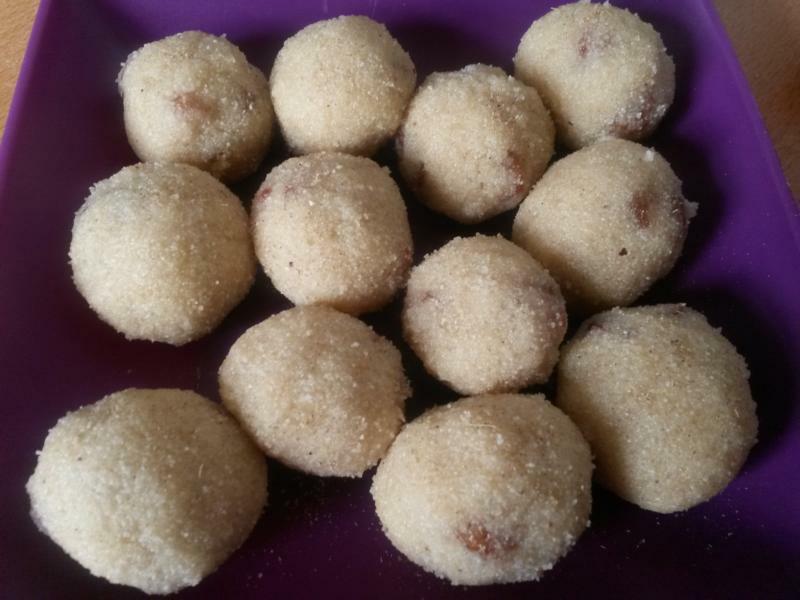 I actually made the ladoos during Diwali because this is one of the easy sweets traditionally made during Diwali and Ganesh Chathurthi; but missed out putting up the recipe. 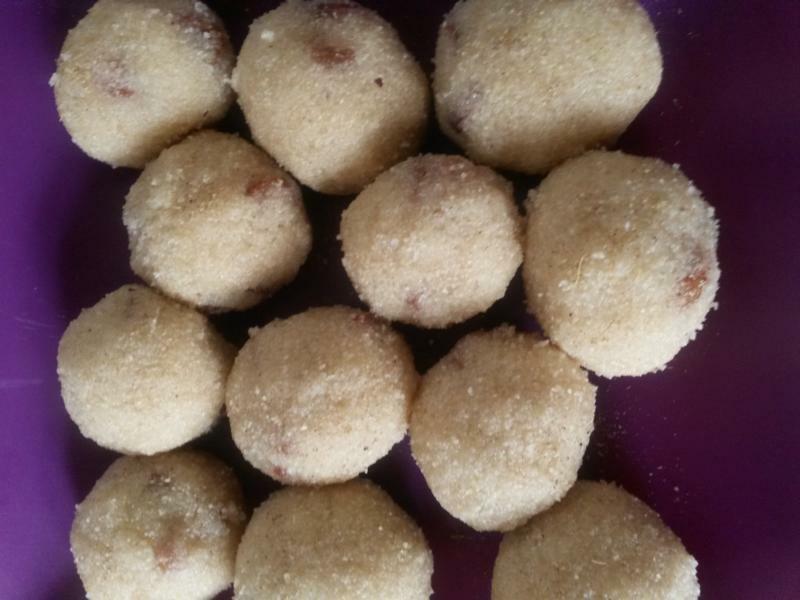 Well it is never too late… Infact, this was the first time ever I tried making these ladoos at home and I was happy with the result. The best part is it barely takes any time or pre-preparation and all the ingredients are very easily available in most Indian homes or can be easily bought at the grocery. 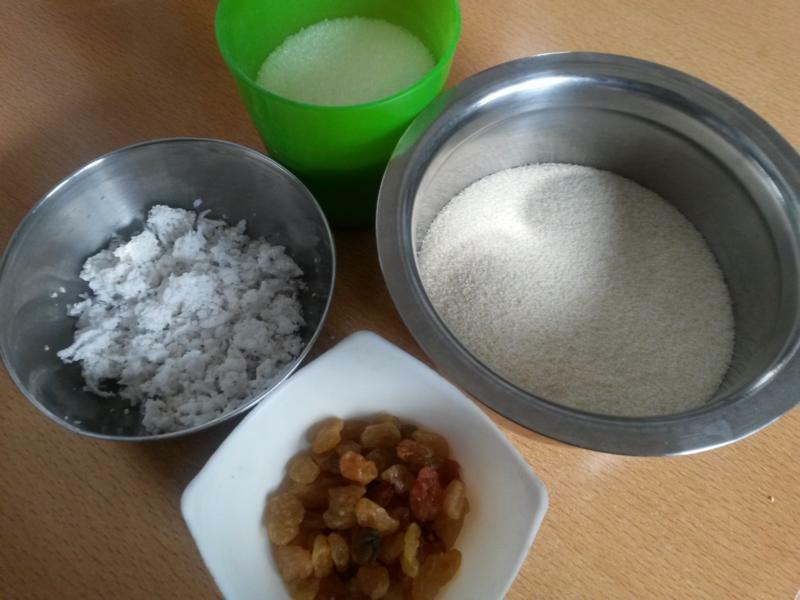 All you need is fine rava/ semolina, grated coconut, sugar, raisins, ghee, and milk. 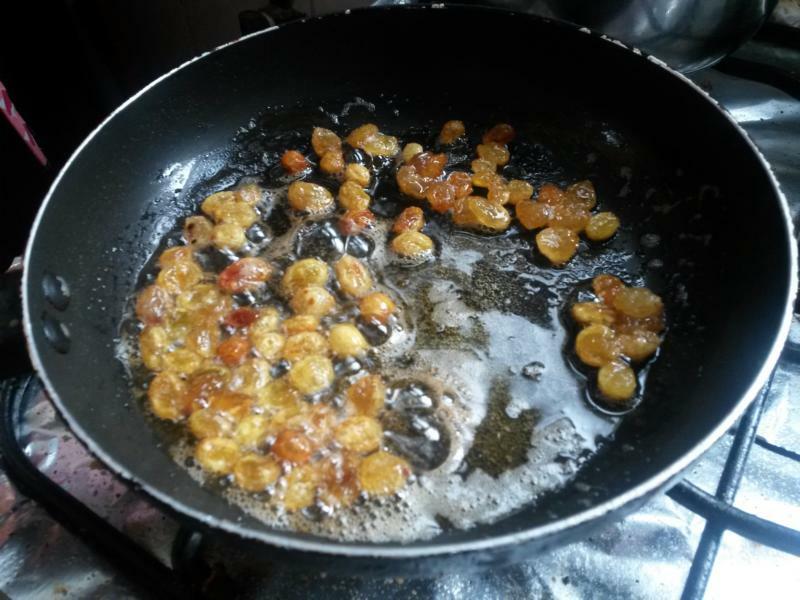 Firstly, heat some ghee in a small shallow pan and fry the raisins till they puff up. Keep aside. In the same pan, roast the grated coconut till almost light brown. Then add the rava / semolina and roast it for a while on low flame, stirring constantly. It is important to keep stirring, as the rava can get easily burnt. Once the rava has turned light brown, take it off the flame and let the mix cool. 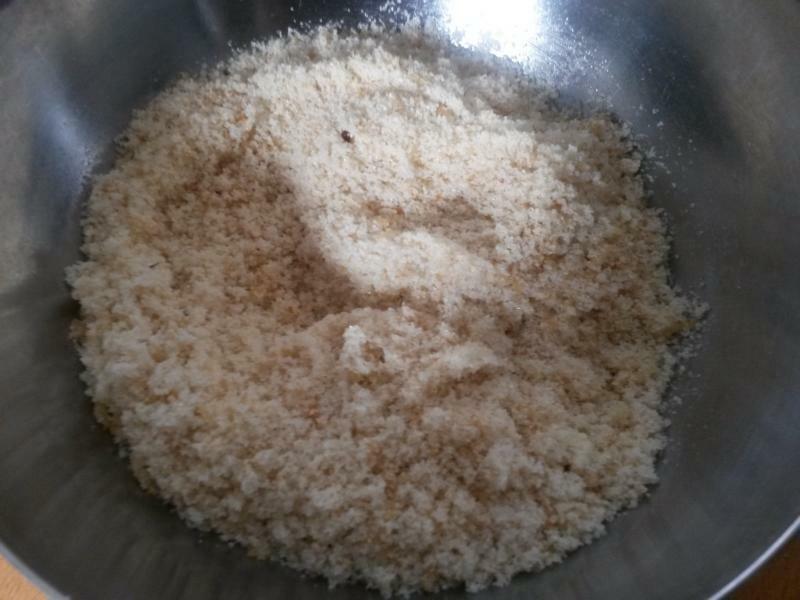 Once it is completely cooled, pulse it for a few seconds in a mixer-grinder to get fine powdered mixture. In a deep bowl, combine the powdered mixture, sugar and raisins. Then add milk little by little and mix well. Start to roll it between your palms into small ladoos before the mixture is completely cooled off and starts to dry up. These are best eaten within 2-3 days as they start to dry up and go stale later, since there is milk in it. In a pan, heat ghee and fry the raisins till it puffs up. Keep aside the raisins. In the same pan, fry the coconut till almost brown and then add the rava and roast it on low flame stirring often or else it will get burnt fast. Once the rava has turned light brown, set it aside and let the mix cool. In a mixer-grinder, pulse the cooled mix for just a few seconds. The ladoos can be stored in an airtight container for upto 2-3 days. Oh, I miss these. I’ve really been craving Indian lately. Thanks Cteavin! One of my favorite festival sweets and they are so easy to make.